SOPA in US and Censorship in India: A cocktail to destroy Internet Freedom ! 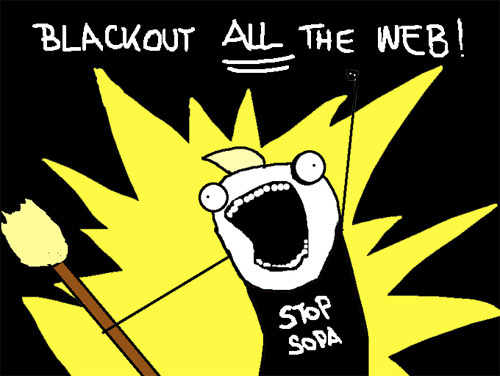 SOPA in US and Censorship in India : A cocktail to destroy Internet Freedom ! As US senators mull over the SOPA(Stopping Online Piracy Act) and PIPA(Protecting Intellectual Property Act) bills, the world stands witness to a historic moment. Almost all big IT companies like Google, Wikipedia, Facebook, Mozilla, Godaddy, etc are speaking in one unanimous voice against SOPA and Internet Censorship. The draconian provisions of SOPA/PIPA are bound to create the deathbed of internet freedom and free speech, and if a careful reading of the proposed legislation is done, one realizes that it is likely to have the same impact on India. In the disguise of protecting copyrights and stopping piracy its completely clear that the US government is trying to assert its control over the free flow of information on internet which is some time uncomfortable to them. Giving power to Attorney General to direct search engines like Google to filter particular search results, or asking an ISP to manipulate their DNS to filter specific IP addresses just at whims and fancies of government all the threatening to accessing information. To make the matters worse on the name of stopping piracy the websites will be held directly responsible for content uploaded by a one of its millions user. And if infringement is proved then apart from banning whole website its executives would be liable to mountainous fines and prison terms along with the user who uploaded content for upto 5 years. So imagine if a teenager ends up uploading a Michal Jackson video on YouTube he may get 5 year term in jail where as the doctor who killed Michal Jackson could get only 4 years. Or if you post a YouTube video link of Rockstar movie song on your Facebook wall, entire Facebook website can be blocked for copyright infringement. To make the matters worse, one of the provisions says if a particular site is banned. Any websites which provides any information about blocked website or softwares it offered can also be blocked. So in a nutshell if a website like Napster is blocked, a website like Wikipedia can also be blocked incase they provided any information about Napster, even if it was merely a hyperlink to Napster’s website And if Wikipedia is banned. all the websites which ever quoted Wikipedia can also be blocked. 80% of Indian websites are hosted on US based servers with companies like Godaddy, which are under US jurisdiction and will fall under SOPA. Websites which are using payment gateways provided by US companies will also be affected. Even the Anti SOPA tools like DeSopa would not work because providing them on any website or using them or providing any information about them would also become illegal. All the paid VPNs we use for our privacy or secure surfing would also be forced to share our data with US government because most of them have their head offices in US. This may spell disaster for people in countries like China and Iran who use these methods or overcome illegitimate government censorships. Onion surfing (chain proxy) tools like Tor would become useless because at the one shot US government will have power to ask all US ISP's, hosting servers to filter any request coming from proxy sites in disguise of stopping piracy. Internet was born in US but it is not a personal property of US government. Any type of laws which will be made in US are bound to be replicated in other countries. And with many governments across the world facing protest for various reason are already toying the idea of censoring the information on internet by some or other means. sometimes by arm twisting, some times by arbitrary court injunctions or some times by framing unconstitutional laws. Currently we are witnessing companies like Facebook,Twitter and Google are landing up in lawsuits in India on the issue of content filtering and government hardening its position against companies. Its not a good sign of for the future of internet, whose freedom we must uphold. Dissent is a integral part of any democracy. If countries like America in the aftermath of Wikileaks incidents frame laws to acquire backdoor authority to censor internet in disguise of protecting intellectual property and stopping piracy. They would be doing a great insult to the very. first amendment to their own constitution guarantying free speech. In India where our fundamental right of freedom of expression is ushering like a diamond hope with every passing year. We must protest any idea or policy which threatens our freedom to do things on innovation of millennium, Internet, Which has no boundaries, no laws, no jurisdictions and no censorships. So in my opinion we must oppose SOPA or any sort of censorship anywhere, before you are left with a internet with filtered search engines, Blocked websites, no free mp3 songs, No proxies, No free softwares and no Wikipedia and no free code snippets too !